One of the things that I looked forward to the most about going to Culinary School was learning how to sauté. I wanted to be able to toss things about in a pan like a champion. It looks so cool. I still to this day ooh and ahh when I see someone toss and catch their food with grace and precision. Learning to sauté was my college version of wanting to grow my hair out long enough for a ponytail: it’s fun to watch it bounce around and makes you seem generally more awesome (said the high-school version of myself whose mother wouldn’t let her grow her hair out). 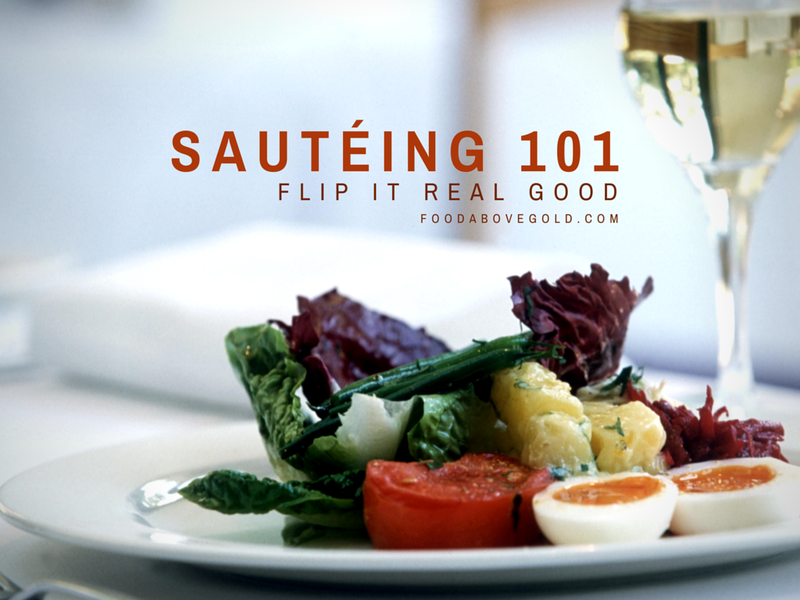 Sautéing derives from the french word sauter – which means “to jump”. It is a dry-heat method that cooks quickly on high heat with a small amount of fat and works best when using small pieces of food. Much of the reason why food “jumps” when sautéing is to get everything mixed together but prevent it from cooking in its own juices. Be careful not to toss it too much, though, because it lowers the temperature of the pan and prevents quick cooking. There are, of course, exceptions to this general rule. Meats are a difficult item to cook because they tend to stick to the pan, right? While sautéing, you can combat this one of two ways. Either by coating the meat in flour or cornstarch (I highly recommend bringing the meat up to room temperature for 30 minutes and blotting it dry first) or by using a utensil of some form to move it around. You’ll most likely get some sticking either way, but you want a little of that for deglazing – which is how you make your sauce. Deglazing is when you use some form of liquid to help lift up the stuck on pieces from the pan. Usually this is done with stock or wine and works best when the pan is nice and hot. If your pan is overcrowded or not quite hot enough it makes it difficult for the liquid to do its job. The important thing to remember is that there is a happy zone for deglazing. If the pan is too hot you will evaporate most of your liquid before it gets the chance to do its job. If the pan is too cold (or overcrowded) you will end up working on pulling up the stuck on bits with your utensil and possibly end up with too much liquid for your sauce. Deglazing is meant as a tool to help you cook, not to give you more work. As an end result, usually you end up with a delicious sauce that has the imparted flavor benefits of the caramelized tidbits left behind when cooking your meat. “But what is the happy zone for deglazing?”, you ask. I’m sure if I took the time (my husband, the engineer, would insist on at least 30 data points for acurate assumptions) I could find the exact temperature range, but who is really going to stick a thermometer in their sauté pan while tossing around food? So, this is where your chef intuition (which is totally a thing) has to come into play. The happy zone for deglazing is somewhere around when, if you let your food sit still for a moment, you can hold your hand about 4 inches over your food and your hand becomes warm enough you want to pull it away. You should also hear your food sizzling but not see it caramelizing. Sautéing is best done with tender cuts of meat, like chicken breasts and veal cutlets, that will cook quickly. Sautéing is also an excellent way to start a dish – which can then be finished by simmering, braising, or baking, for example. Do you enjoy watching people sauté as much as I do? What special tools and techniques do you use while sautéing? I love your write-ups and how easy to make me understand the methods.